The lights have dimmed and the music has stopped. The celebration is slowly winding down. For athletes returning from the Olympic Games – after years of monastic devotion to their sport – what now? The post-Games world is not always an easy one to navigate. Some Olympians will quite naturally continue training for the next quadrennial in preparation for Tokyo. For many others, re-integrating into the “real world” presents real challenges and choices. Age, background and stage of life of Olympic athletes vary greatly by sport and circumstance. Some gymnasts and swimmers will return home to finish high school. Many endurance sports require years of training to reach peak performances, and athletes may be in their late 20s or early 30s when they step away from competition at the highest level. Some athletes have been able to take advantage of a Canadian or U.S. college program to catapult them onto a national team, meaning they may have a degree to fall back on as they enter the next phase of life. Whatever the athlete’s unique situation, one thing is certain: The day-to-day interactions they have in the real world will be very different than those they’ve known in their training environments. They will not be surrounded by people of singular focus, either at work or at school. It will take time to adopt a more “balanced” life, and many will struggle to do so. The transition is rarely a smooth one, even when it ends well. A friend of ours, a highly regarded vascular surgeon, has commented that all he is able to do is surgery. If ever there ceased to be a need for his services, there is literally nothing else he’s qualified to do. A number of retiring athletes face this reality. They are hyper skilled in one narrowly focused field, and for the vast majority of them, that specific skill is not a marketable one. Retiring athletes may never again be as good at anything in their lives as they were at their particular discipline – a difficult realization when you’re 25. They may find it hard to relate to a society so unlike the one they came from. If their Olympic performance fell short of expectations, it can be a crushing way to retire, having devoted so much for what seems like so little. While many of the skills that made them world-class athletes would seem to transfer well to the working world, not all are easily able to make the leap or see exactly how or where those skills may be best put to use. Battles with depression, direction and value are not at all uncommon. Unfortunately (or perhaps fortunately now), I speak from experience. I fell into the category of athletes who had a crushing Olympic performance; in Athens, my eight incredible teammates and I finished with a terrible performance in the final after expecting gold. For us there was no sport psych to help deal with the disappointment, no debrief to air our feelings about what went wrong. One teammate sliced his hand open on a bedside table from the night terrors he was having. For several months afterward, I did little more than lie on the floor of our apartment in Victoria. Once I committed to retiring, my NSO couldn’t move fast enough to defund me and get me out the door. My fiancée and I came home to Winnipeg to start our lives, but it’s clear now that I was in no position to do so. I struggled for years with feelings of failure (and still do, from time to time), with not fitting into a place I had called home my whole life, with making simple decisions about the direction I wanted to pursue. It was not a happy time. It is a strange thing in sport that, in order to perform, we have to create a shield against weakness. Admitting fallibility or worry or doubt, to teammates or to ourselves, can impinge performance. At the same time, facing all of those emotions is critical to our overall mental well-being. While we are in sport, we do a poor job of reconciling the two. Afterward, we recognize the importance, but do little to make it happen. Thankfully we are doing a better (but far from ideal) job of easing the transition of retiring athletes. Athletes are much more aware of the need to consider and prepare for post-competition life. There is far more programming available today than there was even eight years ago to assist with job training, mental health and networking. And athletes are more aware of what they need and how to access it. To be sure, some athletes will be able to trade on their athletic fame and parlay it into a career in the public eye. Others will be fortunate to carve out a professional career in their sport. Still others will have prepared well and will transition easily into their post-competition lives. 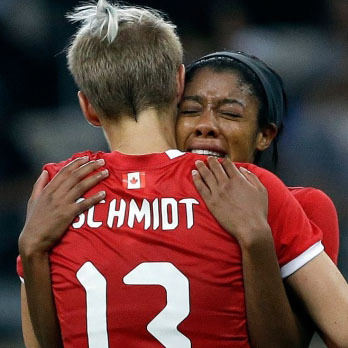 But Canada sent more than 300 athletes to Rio, and many are coming home to an uncertain future. Part of our job at the Canadian Sport Centre Manitoba is to help athletes find their paths with whatever services are needed. It is incumbent on us to return these people to their communities healthy and ready to make a world-class contribution in the next phase of their lives in exchange for the thrills and excitement they provided us – and in recognition of the unheralded commitment they made to get there.